Auctions are thrilling events which never fail to cause excitement, and this is even more apparent when the stakes are high. Buying a house through auction can be a great way to find your dream home for the perfect price, however there are a range of things you should know before you raise your hand to bid. Here are some important things to keep in mind when preparing to buy a home on auction day. Before even thinking about bidding on a house, it’s essential that you make several inspections to be sure that the property is truly what you are looking for. It’s important to build a good rapport with the real estate agent who is looking after the house, as they can give you important insights as to house prices in the area and what you might be able to expect when it goes to auction. Once you are happy with the house and have a good idea on what it might be worth, you can start preparing for the auction itself. 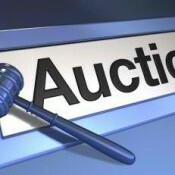 It’s a good idea to attend several auctions in preparation for your first attempt at bidding. This allows you to get a better feel of the auction process, and pick up some important insights on what to do when you’re looking to be the strongest bidder. Picking houses pitched similarly to the one you are interested in can give you invaluable information on how the bids might escalate, and how high the end price will go. One of the most important things to remember is that bidding in an auction means that you legally agree to buy the property should you be the winner. With this in mind, it is essential to have your finance ready to go so that you can walk into the auction in a clear frame of mind and be ready to sign for the house. Click here for a review on one of Australia’s leading home loan lenders, and find out how they can help you to get the right loan for the house of your dreams. On auction day, it’s normal to feel a twinge of nerves as you get ready to bid for your ideal home. By knowing your bidding limits, you can work on controlling your nerves and focussing instead on making clear, confident bids. If it looks like the bidding is going past your set limit, you need to have the strength to accept that you have placed your final bid and should start looking for a new property. When preparing for the auction, if you feel like you may get carried away with the bidding, you can use an agent, friend or family member to bid for you and ensure that you don’t go over your limit. By being prepared and planning ahead, you are giving yourself every chance of success when bidding for your new home. With these tips in mind, you can enjoy the exhilaration and adrenaline of buying at auction, and feel ready to make the most exciting purchase of your life!